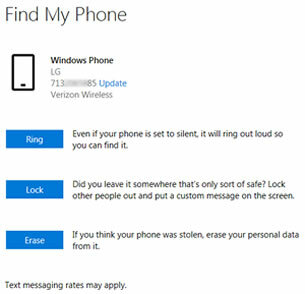 Find My Phone is a service that allows the user to ring, lock, erase or show the location of their phone on the map from any Internet-connected computer. This offers the user the ability to locate their device and, if necessary, protect the data on the device by locking it or erasing the data remotely. From a web browser, navigate to: Manage your Microsoft devices. From the Your devices page, click Find my phone (located to the right of the device name).